After the removal of the Laurel tree and the first two beds of plants (and bulbs – grrr!) my garden on the right hand side was looking nothing short of bare and baron. I had planned to continue working towards the top of the right hand side of the garden, but due to the fact that I had the beginnings of unexpected colour in the form of perennial sweet peas, I decided to leave this area and enjoy the little bit of colour that this one part of the garden was willing to offer. After seeing just how many weeds (and chuffing Muscari bulbs!) had taken over the area, I knew this wasn’t going to be an easy task. I knew I had some plants in pots which I needed to find a suitable place for over the winter and because of the steepness of the middle part of the garden, I knew the safest place for them was going to be the top bed. So, with hand fork and trowel I continued my mission with the Muscari bulbs, the removal of the mini-boulders and the weeds! The ground up in this area wasn’t nearly as easy to work as in other areas of the garden and had obviously not been touched for quite a while. I was also intrigued to find several ‘lumps’ of good old concrete within the soil which did nothing for my wrists or shoulders whilst digging away with my hand fork! in all fairness it took me a good fortnight to get the bed clear. The weather was a bit iffy and so progress was hampered by the odd summer deluge. The hardest part had been removing an ornamental grass that had roots like you wouldn’t believe! In the end, I had to get Trist to help get the fork under the roots just so I could stand any chance of removing them. So after my initial burst of enthusiasm and work in the garden, I am afraid the Great British weather kept up tradition and presented itself with a couple of weeks of traditional dismal, grey and wet weather. 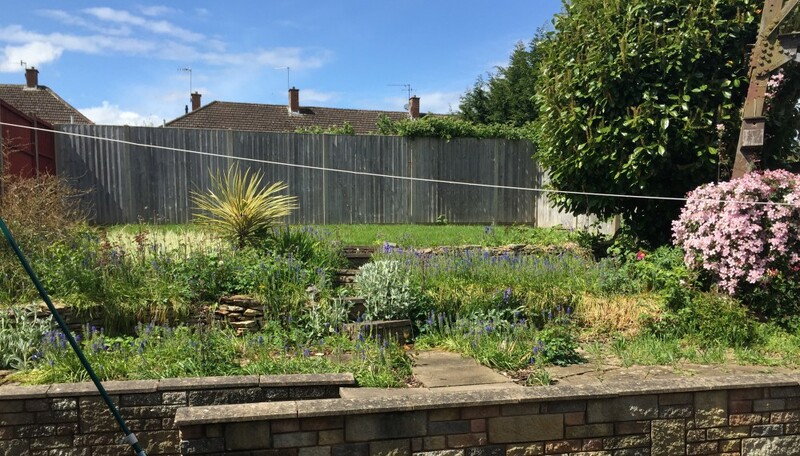 I have to admit that much wasn’t achieved in this period and so by the end of it I was literally ‘chomping at the bit’ to get out into the garden and continue with my makeover. Trist had popped out with Will one sunny, Saturday morning and armed with an energy drink and a hand saw, I decided to tackle the Laurel tree. What started out as a 25 foot + tree when I started soon started to shrink in size and stature. I knew that I was going to be in sooooo much trouble when Trist came home so, my only option was to get as much down as I could before I heard the van approaching. Within the space of a couple of hours I had made, what I felt was really good progress and then I heard it. The sound of a T4 pulling up on the drive and I knew I was in for a severe ticking off! It wasn’t so much that I was chopping down the tree, it was more to do with the fact that my Husband knew I would expect him to put all this garden waste in his precious T4 and it was inevitably going to make a mess. The branches and leaves had literally taken over every part of the garden! In order to maintain domestic bliss (!) I spent the next couple of days cutting down branches and bagging everything up. I then made 3 trips to the skip myself (I only have a VW Golf!) trying to remove as much of the small pieces as I could. This left the bigger branches for Trist to take to the tip for me, as I physically couldn’t a) get them in my car or b) lift them. Even though it was entirely obvious he was not happy about it (don’t think he spoke to me for about 3 days) credit where credit’s due, he took the bulk of the wood to the tip for me.